What motivates “millennials” in the workplace? A generation change is happening in the work force. In 2025, 3 out of 4 workers in the world will be millennials (Schawbel, 2012). But one doesn’t have to wait 10 years to see this coming, the millennials are already in the workforce and their values, their attitude to work and motivation has and will forever change the working environment. Companies have started to understand that in order to be more competitive, they should adopt Theory Y theories, which means to involve and engage their employees vertically, have less task specialization and use collaborative teams. Entering a workplace today is very different from how it was 20 years back. Herzberg (1959) introduced the two-factor theory, where things like salary, job security, status, fringe benefits are considered hygiene factors, and recognition, achievement, responsibility, advancement, work itself and growth are considered motivators. Herzberg’s two-factor theory is well known in business and can be seen as a base of how people are motivated at work. In a Harvard Business Review article (1987), an article written by Herzberg, he goes hard against the common beliefs at the time, arguing that the usual ways to try to motivate employees is a failure, as they all are “KITA” – Kick in the rear (Herzberg, 1968). Herzberg expands on the, at the time, new concept called Job enrichment, which shouldn’t be Job enlargement, using vertical enrichment – and the positive effects this had on the participants of the study. It’s interesting to read that despite 57 years of corporate management theory development, some companies still use the KITA, either with a push or a pull in order to try to make their employees do what they want. It’s still very real, just as Herzberg suggests, to use the “inner generator” of people instead of KITA. “The precept that the worker has to work out of duty is no longer valid, and it becomes apparent to management that the worker must be willing – if not eager – to work. Once this principle is recognized, managers have a responsibility to do something about the motivation to work.” (Herzberg, 1966, p. 35). “People work effectively when they are well treated physically”. (Herzberg, 1966, p. 36). The next contribution to the understanding on how millennials are motivated are researched by C.Turnbull (2011) who conducted in depth-interviews with business students in order to understand what their main motivation is. 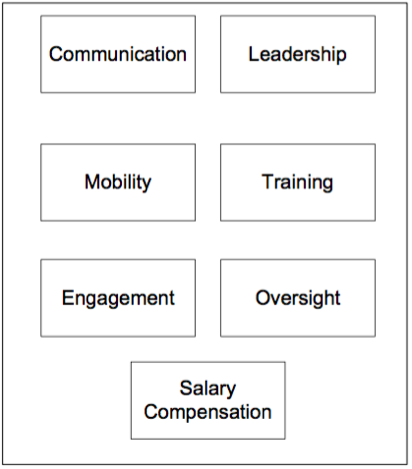 Communication, Leadership, Mobility, Training, Engagement and Oversight are very important and sails up as the most important motivation factors. In my master thesis “What motivates professional early millennials in the workplace and what is the best way to manage them to reach their potential?” I further research how well these Seven Areas of Work Motivation relates to millennials. Stay tuned! Herzberg, Mausner, Schneiderman. (1959). Motivation to Work. Publisher: John Wiley and Sons. Herzberg, F. (1968) One More Time: How Do You Motivate Employees? Republished 1987 in Harvard Business Review. Maslow A., (1943) “A Theory of Human Motivation”. Originally Published in: Psychological Review, 50, pp. 370-396. Available at: http://psychclassics.yorku.ca/Maslow/motivation.htm Accessed on [January 18th 2016]. Schawbel, D (March 29, 2012) “Millennials vs. Baby Boomers: Who Would You Rather Hire?” Time, URL: http://business.time.com/2012/03/29/millennials–vs–baby–boomers–who–would–you–rather–hire/ Accessed on [January 11th 2016).